California living means outdoor living. Thanks to our state’s amazing climate, outdoor living spaces are one of the most sought-after additions to a residence and beautiful functional outdoor kitchens are a key component of these al fresco remodels. When designing a kitchen that will be exposed to the elements, it is important to consider the materials used, especially for countertops. Harrell Designer Lisa Parramore advocates her clients choose either Quartz or natural stone for exterior kitchen surfaces. Quartzite is a hard metamorphic rock created naturally from pure quartz sandstone while Quartz is a man-made material that offers a huge variety of looks, from solid colors to patterns that mimic the look of marble, granite, and other natural stone. Manufacturers like Cambria, Silestone, and Caesarstone have an almost endless selection of colors, styles, and finishes. Quartz is a popular choice for countertops, but when using it outside, it is important to note that this material does not appreciate sun exposure. Quartz is best used in outdoor areas where sunlight is limited to eliminate or severely reduce any chance of fading. Manufacturers typically will not guarantee their product if it is used outsides where it receives extended exposure to direct sunlight. Quartz lovers never fear. There is a solution to this dilemma—Ultra Compact Quartz. Manufacturers of this product include NeoLith and Dekton. No maintenance, easy care, stain, scratch, and dent-resistant, this almost indestructible material is ideal for outdoor use. Available in a variety of colors, Ultra Compact Surfaces enable homeowners to achieve their desired design aesthetic without worrying about fading, functionality, and durability. “For clients desiring a contemporary look, I love using Ultra Compact Surfaces with powder-coated stainless steel cabinetry,” shares Lisa. Natural stone is another popular option for use in outdoor kitchen spaces. The most popular outdoor surface products include granite and marble, each with their own pros and cons. Granite is durable, resists staining, and is readily available in a multitude of hues but extreme temperatures can comprise the integrity of the surface. It is also wise to use light colored granite if it will be exposed to sun, as darker shades will retain a tremendous amount of heat. “Part of the beauty of granite is its naturally occurring, shimmering crystals but severe heat and cold can result in the stone cracking,” Lisa clarifies. Marble is another stunning surface that homeowners love. Though it doesn’t fade, marble can stain if not properly maintained. For those who don’t mind a “patina,” marble is a viable outdoor option but if the possibility of discoloration makes you, cringe, marble may be a material to avoid. In the majority of her outdoor kitchen designs, Lisa uses granite, Quartzite, and Ultra Compact Surfaces. Marble typically has a polished finish, while granite can be either honed or polished. Depending upon the Quartz product chosen, they can have a low sheen, high gloss, or even a velvety-soft suede finish. “I always recommend checking with the fabricators when deciding upon exterior materials and their planned location. Their in-depth knowledge is invaluable to retaining your product warranty as well as ensuring the surface chosen meets your needs and expectations,” Lisa advises. Lisa Parramore is Harrell Remodeling’s award-winning certified Professional Landscape Designer. She is passionate about creating indoor-outdoor living spaces that inspire her clients to embrace and celebrate the California lifestyle. With her ability to beautifully integrate a home’s interior with the outdoors, Lisa brings a distinct vision and design sense to the Harrell Team. 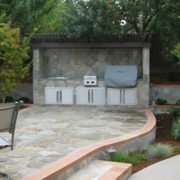 Are you thinking of adding an outdoor kitchen or living space to your home? Now is the perfect time to start a conversation with one of our designers about creating an outdoor space that fits your lifestyle. Outdoor living areas are one of the most sought after home improvement spaces for leisure and entertainment. One of the most challenging aspects of making these outdoor rooms both functional and enjoyable is finding that sweet spot between sun and shade while mitigating the impact of rain and other elements. Though traditional architecture offers some solutions, it also has its limitations. Enter the revolutionary louvered outdoor structure from Struxure Outdoor (formerly Arcadia Building Products). 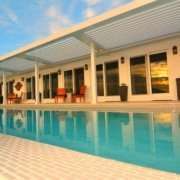 The zero to 170-degree louvered roofing zones can be opened to a multitude of angles, providing the ideal amount of shade or sun as desired. 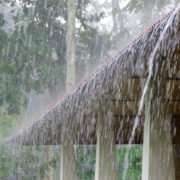 They can also be closed completely, keeping out the rain or offering a fully shaded environment during the heat of the day. In keeping with Smart Home technology, the iLouver app allows homeowners to schedule pre-set daily open and close times as well as choose from preset louver positions. 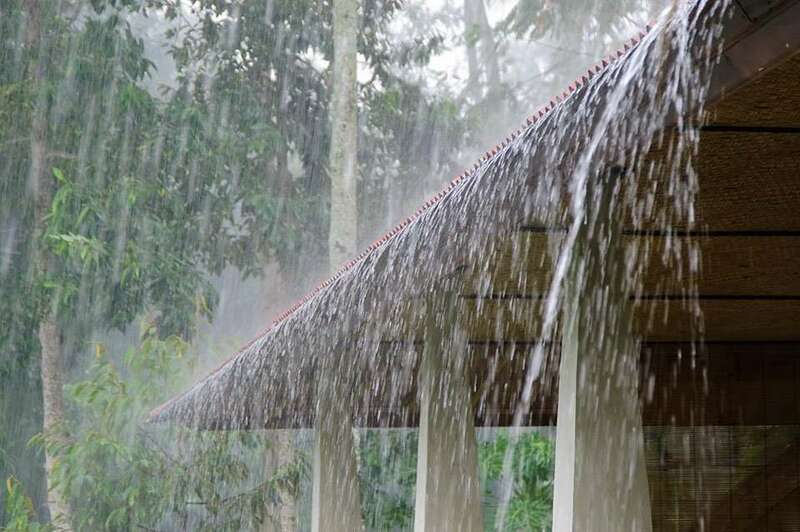 An optional rain sensor shuts the interlocking louvers automatically at the first drop of rain, funneling to the built-in gutter system that can either be directed to an existing downspout or to a downspout hidden within its posts. Electrical wiring for lighting, heaters, and ceilings fans can also be tucked away inside beams for a streamlined appearance. The epitome of distinct outdoor luxury, these scalable structures can be designed for spaces large and small, including patios, courtyards, decks, swimming pools, entryways, verandas, as well as outdoor kitchens and living rooms. Manufactured in the Unites States from durable powder coated aluminum, these innovative pergola-type structures are engineered and built to the exact specifications required in your unique outdoor space. Able to withstand severe wind and weather, homeowners don’t have to forego appearance for steadfastness and durability. Each design also undergoes a comprehensive structural engineering process, adhering to all local building requirements. Struxure’s state-of-the-art outdoor configurations fit any architectural aesthetic, from traditional to contemporary. Clients can choose from five standard color options and a myriad of custom colors as well as optional architectural elements including traditional rafter tail and cornice designs. These high-end outdoor systems also allow your local remodeling company to customize the pergola on-site to further enhance the appearance matching it with the exterior of your residence. 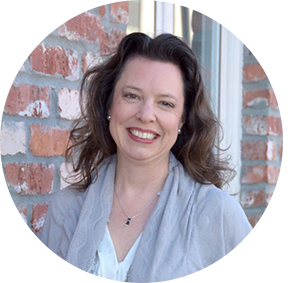 Harrell Remodeling’s award-winning certified Professional Landscape Designer, Lisa Parramore is passionate about creating indoor-outdoor living spaces that inspire her clients to embrace and celebrate the California lifestyle. After living and working for two years in Japan, her projects embrace the extraordinary relationship between traditional Japanese architecture and its surroundings. Lisa co-authored the winner of the 2006 Best Gardening Book Award, Living with Japanese Gardens, and Japan Home with Chadine Flood Gong, ASID. With her ability to beautifully integrate a home’s interior with the outdoors, Lisa brings a distinct vision and design sense to the Harrell Team. Fall in love with your backyard again! Start a conversation with one of our designers today about creating an outdoor space that fits your lifestyle. Images courtesy of Struxure Outdoor. Are you ready to spend more time outdoors without leaving the sanctuary of your home? 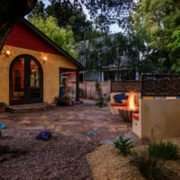 Do you want to fall in love with your back yard again and add to your home’s useable footprint while enjoying the Bay Area’s world-renowned micro climates? There are many different hardscape features and ideas that will enhance the outdoor living experience in your home. Hardscapes are typically defined as the fixed objects in landscaping, such as brick and tile patios and pathways, pergolas, stone walls, wood decks and other similar structures. Create a shaded seating area with a solid-roof gazebo. Furnish it with a small table and chairs, a swing or built-in benches. Pergolas provide filtered shade without blocking your view of the sky. Choose materials like cedar, steel, vinyl or aluminum to coordinate with other outdoor-living components in your yard. Rediscover the outdoors with the installation of a deck or patio with wood planks, pavers, concrete, natural stone or brick. Add outdoor furniture, a hot tub, fire pit or a kitchen to create a space for relaxing with family, and entertaining guests. Add some refreshing splash to your back yard. Instead of your typical pool of the blue-and-white rectangular variety, use instead, natural stone basins and borders. Add waterfalls, unusual shapes and graduated levels to your custom pool. Surround it with a brick patio or a multi-level deck with seating. Large stone sculptures or a thoughtfully-placed stone fountain can be a beautiful focal point for your back-yard. Large rocks built into a low wall along a pathway or perimeter, convey a touch of rustic elegance and can create a terrace effect. Consider granite, limestone or slate for a beautiful yet natural look. If you’d like to create something extraordinary with the outdoor living spaces in your Bay Area home, the design-build professionals at Harrell Remodeling can help. Contact us for details. You will be floored with all the choices! Outdoor kitchens are known to be a beautiful extension of your home that can be used to relax or enjoy your time with family and friends. Transform your existing patio into an outdoor kitchen or create a new outside addition in a space that isn’t currently being used for anything else. Aside from size and location, one of the key and first areas to consider when you’re thinking about outdoor kitchen remodeling is your outdoor flooring. Outdoor kitchen floors should be a flat surface where you can comfortably walk and stand. Choose a material that is durable when exposed to the elements and materials that meet the safety criteria include concrete, brick, engineered stone and natural stone. After safety, consider your design needs and budget. Because of its affordability and durability, concrete is still one of the most popular outdoor flooring options – there is stamped, colored or a rock-salt finish. Flagstone is a durable option as these stones aren’t easily damaged when exposed to the harmful elements. Flagstone does not crack easily and it is not destroyed by termites or other such insects as compared to wood patios which can have both of those problems. Slate is available in a variety of colors and textures as these are made up of a fine type of rock that retains its natural appearance and is smooth and flat. Ceramic tile is a popular choice that offers a variety of colors and finishes to choose from and, in most cases, is adequate in terms of slip resistance. The old standby is brick and is a traditional favorite for a reason – it’s attractive, water and heat resistant, easy to clean and blends in well with all types of furnishings. Porcelain tile – this durable, low maintenance material is making a grand re-entrance with texture, color, the ability to mimic most stones and even wood surfaces, and is a great choice for those who are budget minded, Steer clear of surfaces that are easy to crack or are slippery when wet, like glazed ceramics, porous surfaces, polished stones and glass. Crush-and-run stones are uneven and impractical for a kitchen floor. Field stone / Blue stone – a natural and rustic touch is created when Fieldstone is used in an outdoor living space, especially if the natural stone hasn’t been cut. For a more formal and elegant look, you can use Field stone that is shaped into rectangles and squares. If you’re not sure what you need or want, talk things over with our Harrell Remodeling design + build team, we’ll walk you through the options and the process so you can have an outdoor kitchen that you’ll truly love. 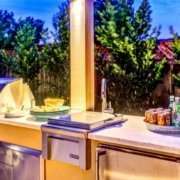 https://harrell-remodeling.com/wp-content/uploads/2013/09/bay-area-outdoor-kitchen-grill-LARGER-2.jpg 675 900 thepointcollective https://harrell-remodeling.com/wp-content/uploads/2017/09/Harrell-Remodeling-Logo.png thepointcollective2016-09-05 09:51:142018-11-19 15:21:33You will be floored with all the choices! Spring is right around the corner. This is a good time to take an inventory of your deck. Look at the structure and decide whether you need any outdoor remodeling or repairs to make it safe and attractive for the upcoming season. Go beyond a simple cleaning. 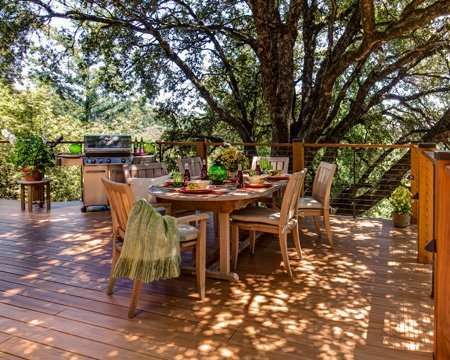 If your wood looks drab or splintered, your deck may need a facelift. If your deck isn’t a place you like to spend time, think about why it’s not. Is it the weather, or is it that you don’t feel comfortable using it? This is also a good time to think about what elements you can add to make it more inviting. From outdoor furniture to shade to music and lighting, the possibilities are endless. Whether you want to enjoy the sunshine or curl up in a shady corner with your laptop or a good book, add in some more function to make it a haven. Any warped flooring or supporting structures should be replaced. Make sure that there is just enough space in between your wood slats to allow air to circulate. This will minimize problems with mold or moisture. Check the framing and make sure that it is safely and sturdily attached to the home’s structure. Treated wood and natural stone materials are sturdy and attractive materials that can change the look of your deck. Be sure that flooring is intact and not slippery. If it is an uneven surface, decide whether that might create difficulties in balance or mobility. If you have a wood surface, you may wonder whether you should paint or stain. Surfaces that have already been stained but look drab can be re-stained and sealed. As a general rule of thumb, stain handles foot traffic and weathering better than paint. Paint tends to chip, crack and peel. Once you have decided the type of work your deck needs, determine whether it’s something you that requires help from a professional. 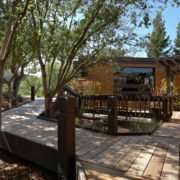 At Harrell Remodeling, we not only do design and build remodeling projects for decks, we also offer handyman services for Bay area homes. Contact our office today at 650-230-2900 to discuss your needs with our staff. With skies clearing, temperatures warming and flower buds forming, it won’t be long before you find yourself yearning to spend more time outdoors. What better place to enjoy summer than out on your deck, unless of course, it looks weathered, worn and unsightly. Doing a deck tune-up, while not effortless, can be a very rewarding experience because the improvement in appearance can be quite dramatic. First off, it’s best to make sure the deck is sound, as it doesn’t make much sense to improve the appearance, if repair work is required. Obviously if the deck or railings feel unstable in any way, you may want to get a professional opinion or structural assessment about what can be done to improve that. But if it feels sturdy and the framing is accessible, inspect it to make sure that the connections are tight and that there are no obvious signs of rot, insects or other damage. 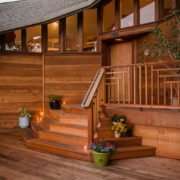 Older decks in our neck of the woods are sometimes constructed in part or even completely of untreated Douglas Fir, a strong wood when protected from the elements, but highly susceptible to rot and insects when exposed to weather because it lacks the natural protections found in Redwood or Cedar. Clean loose debris from between the deck boards with a putty knife and leaf blower. If the deck boards are too tight (less that 1/8” apart), you may want to make adjustments because the boards need air to circulate around them to avoid rot. Next check the nails, screws or clips that attach the deck boards to the frame. If they are loose or not flush, reset them to tighten them up. If the boards are extremely weathered or splintering, sanding the deck will be the only way to smooth them out, but you may want to consider getting professional assistance if this level of repair is required. Next it is important to have a few days of clear, dry weather before and after cleaning and finishing to make sure the finish material makes a good bond with the deck. As a rule, decks should be stained/sealed rather than painted because stain penetrates the wood and erodes slowly over time, but paint is a relatively thick surface coating that with traffic and exposure can lose its bond and chip off. Once painted, it is very difficult to remove the paint and go back to stain, so if it is painted, the surfaces will need to be well prepped and cleaned prior to applying new primer and paint. If re-staining, a good, clean, and dry surface is important. Commercial cleaners are available and typically their active ingredient is oxalic acid. Pre-rinsing the deck will loosen the largest particles and help the deck accept the cleaner. The cleaner can be applied with a broom or brush then allowed to sit for several minutes to remove stains and ground-in dirt. Persistent stains can be given a second cleaning, but be sure to “feather in” to avoid a spot-cleaned appearance. Then a good rinsing is in order with a strong spray (not stream) of water. Avoid pressure washing unless you have had a lot of practice as it is easy to scar and even shred the wood surfaces with the high-pressure spray. Once the deck has dried out for a couple of days (and there are a couple of dry days in the forecast ahead), a new stain/sealer can be applied. The other extreme of direct sun should also be avoided. Finishing the deck early in the day will give the stain/sealer a chance to penetrate deeper into the wood before the heat begins to dry it out. To avoid variations in the finish, it is important to keep a “wet edge”, and doing a section at a time with a clean break such as at a deck board or other termination point will yield consistent results. Of course, if this all sounds like too much work to you, don’t let that stop you. Harrell Remodeling would be happy to lend a hand because we know that properly maintaining a deck will add many years to its life, saving a lot of money in the long run, as well as providing a pleasurable place for you to enjoy those lovely days of summer and warm nights ahead!